Elephants are not only the largest land animals, they grow up in “big families.” Cousins and aunts help teach and baby-sit younger elephants. The wisest, older, grandmother elephant leads the group to food and water. Elephants can tiptoe silently in a forest or crash through trees, can delicately peel oranges with their useful trunks, and communicate with each other from miles away. Here is a close-up look at the fascinating day-to-day lives of elephants. They’re big, that’s for sure. You can’t help noticing that about elephants. I noticed it the first time I saw an elephant, at a zoo in Washington, D.C. when I was likely no taller than the elephant’s knee. 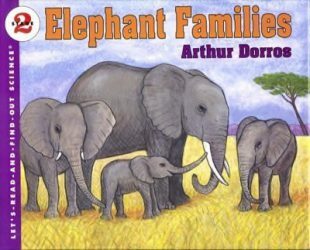 The elephants moved slowly, and it seemed purposefully, as if they were thinking important thoughts and did not want to be hurried. Later I learned it was true that elephants certainly have good memories. For example, the leader of an elephant family can remember from year to year where a particular fruit tree is and will lead the herd of elephants there just when the fruit is ripening and ready to eat. Elephants remember one another, and will recognize each other even if they have been apart for long periods of time. And elephants can communicate using sounds that we can’t hear, rumblings that they make from deep within and that they can hear from miles away. The sounds have specific meanings: the elephants can tell each other, in at least some senses, just what they’re thinking. I wasn’t sure what the elephants were thinking as I went to the circus when I was about seven. But I can remember the smells and the surprising soft touch of an elephant’s trunk as it gently flicked out to touch and smell me as I walked by in awe where the elephants stayed when they weren’t performing. One elephant, perhaps cramped from the long train ride between cities, decided to take a break as a parade of elephants was led around the parking lot for exercise. The elephant sat on a car, and well, the elephant came out on top. It wasn’t until I went to Thailand as an adult that I saw elephants in their natural surroundings. Seeing elephants wandering through tropical forests, with branches to grab and rivers to swim, was much different than in the confines I’d seen them before. Asian elephants used to be found widely throughout much of tropical Asia. As their habitat is diminished when forests are cut down or land is used for growing crops, Asian elephants in the wild are confined to relatively small areas. African elephants still have more space to roam, but were threatened severely by those who wanted their ivory. In years since the ivory trade was made illegal, the numbers of elephants started to climb in Africa. I have heard rumblings in my family of going to see the elephants there, in their free-roaming family groups.